Weeks of cooler creekside camping are the plan……just as soon as we make it to Tennessee. 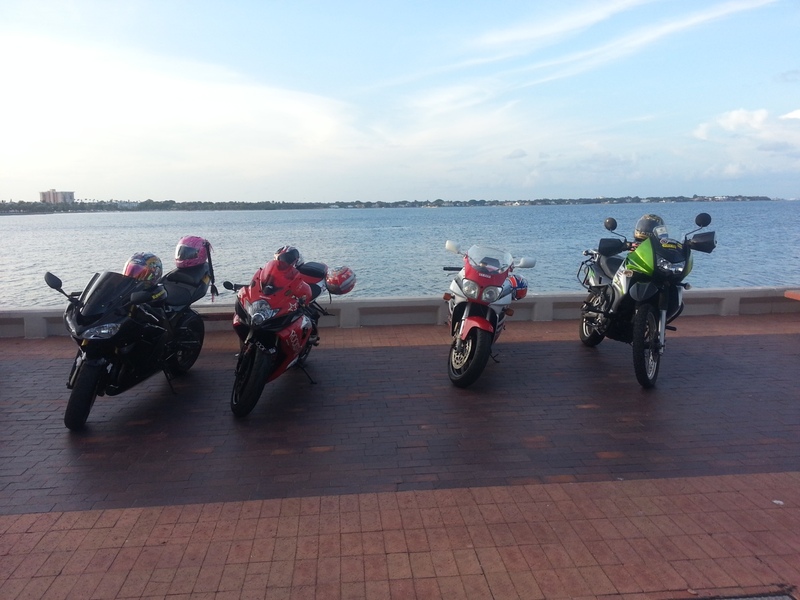 We have stayed over a couple of extra days in the St Pete’s area for several reasons. 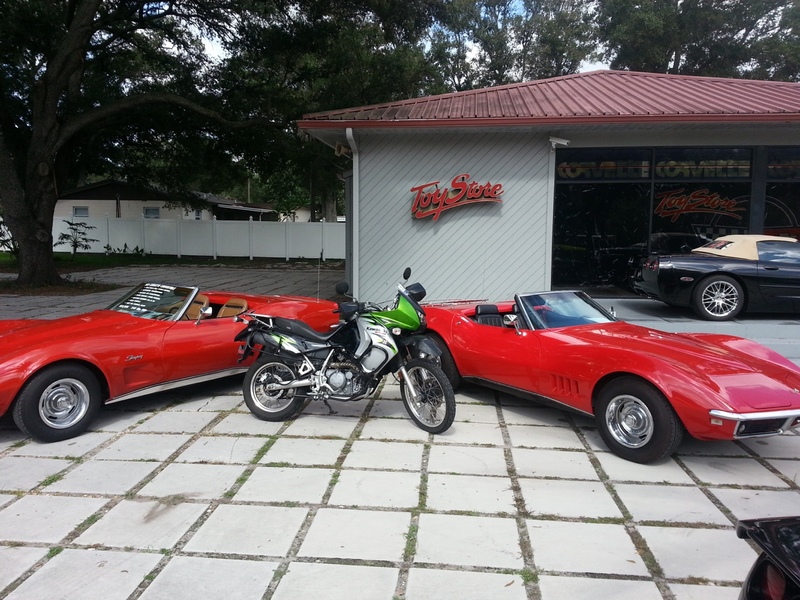 Kimmie Lou wasn’t herself – idling rough – stalling ……typical gulf shores alcohol poisoning, stay out of the sun, stay better hydrated and only short fun rides for the next few days was the prescription from the guys at St Pete Powersports. 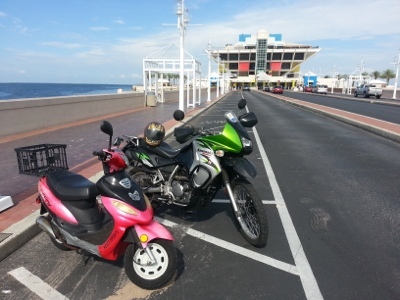 “Take her down to the pier for some nice salt air” suggested Sailor/Biker Jeff , but don’t let her belly up to Johnny Reno’s bar” cautioned Matt, “yeah – keep her air filter dried out for awhile” pleaded Dave & Troy. We wander around the Pier, a few bikes start parking around the promenade, a band is setting up in front of Johnny Reno’s. 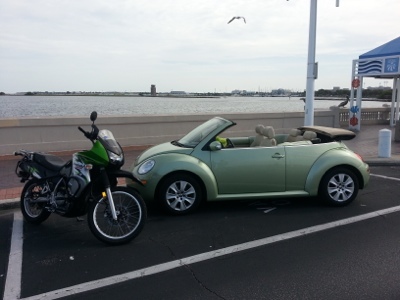 We decide this looks good, “let’s get Kimmie Lou parked over with these sport rockettes.” The walk back along the North side of the Pier’s causeway turns into a run when we realize Sheila is all by herself ! When she sees the look on our faces she laughs and says “it’s okay, Kimmie Lou’s ova thewre chattin up Mawgawita. Somehow Kimmie Lou has got across the curbed causeway and does seem engaged with a very large Margarita. Kimmie Lou has always had a thing for ragtops and we chat for a little while, Margarita hangs out in Tennessee sometimes. “You must do ze Tail of ze Dragon,” Margarita burbles – “it’s exhilarating!” After wrapping things up with Margarita and Sheila we are out to the water’s edge. Kimmie Lou settles in with some sport bikes who are a little snotty at first then liven up when she starts to talk Tail of the Dragon. ” A gazillion curves, varied elevations, reducing radius turns……..yeah, yeah – probably very therapeutic in a crap your pants kinda way! “We did put Kimmie Lou’s disc lock on back there right?” The Corona is cold, the Grouper is blackened but something just isn’t right. “Yeah, I’m thinking that Sheila Scooter was pretty shifty.” Another swallow of grouper sandwich, “and…eh..what about the Pelicans?” “They’re watching us.” We casually look around the restaurant, nobody is looking at us so we probably have not been moving our lips but from where we are sitting at the bar we can make eye contact with at least 5 Pelicans sitting around the edge of the pier. “Is Kimmie Lou in on it?” my gut wrenches at the thought. “Nah, she’s got a little extra freak on right now, but nothing shady.” We pay the check and decide to get back to the ranch. 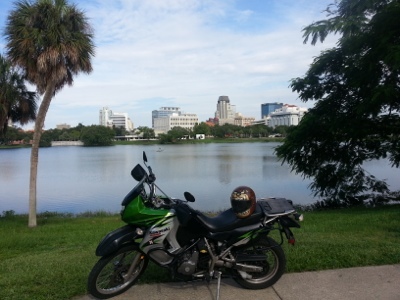 Riding back out of Downtown St Petersberg, Kimmie Lou says “hey let’s get a picture at the lake, it’s where it all began.” “What began?” we both say. “The slip” she says, didn’t you feel it?” Now that she mentions it we can sense that something did change on our circles and more circles of this calm Mirror lake. Tags: Corona, Corvette, Johnny Reno's, Largo, Mirror Lake, Pelicanos Banditos, Scooter Lisp Awareness Week, Tail of the Dragon, The Pier, Toy Store, VW Beetle | Permalink. I’m already feeling sorry for Kimmie Lou. Poor thing being saddled with the likes of you two. What did y’all do to her? The trip was just getting started……everything was all over the place. Things smooth out somewhat (no more getting Kimmie Lou drunk) but we still fumble along quite a bit.